This is obviously a very early build for the new Ford / Amazon voice tie-in... but it looks hugely promising. If I were to lie on the sofa at home right now and shout at someone to start my car, I'd (at best) be greeted with an icy, deathly stare. But later this year things are going to change, as Ford's teamed up with Amazon to bring the latter brand's Echo device into the car arena. Ford wants your car to be as much part of the internet of things as turning on your lights with a smartphone, and using Amazon's Alexa voice recognition technology you'll be able to simply bark a command in any room that's got an Echo set up to interact with your car in a number of ways. And it'll work in reverse too: if you're driving along in a newer Ford, you'll be able to use the voice commands to speak to Alexa and change things in your home without being there. The idea of your vehicle being an internet-connected part of your life makes a lot of sense: your car captures a fantastic amount of data about you, ranging from letting your house know that you've actually left (and can therefore turn off the heating) to your location and speed to warm up and light your home at the perfect time. 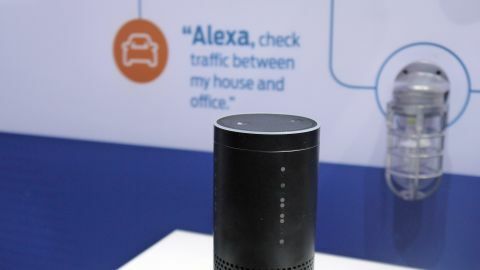 I had a chance to take a sneaky peek at the new system at CES 2016, and even in the very crowded, noisy arena the Echo worked startlingly well, picking up the 'Alexa' command to head into voice recognition mode very well. It also took a couple of attempts to make it work properly (I needed to speak very deliberately), but I think over time you'd learn how to use it efficiently, and you'll be able to remote start your car from your house. The idea of starting a car remotely is scary to some at first, but when you realise it's locked and can't get away without you in there holding the keyfob, it's less of a worry. The ability to perform this action isn't anything specific to Ford - it's just the open SDK that Amazon offers for its Echo device to get other brands to start using it and expanding the internet of things world. Amazon did have a hand in accelerating the approval process to get it ready in time for CES this year, but the ease of creation for this project is impressive. Ford's representative told me that the brand only started coding this ability at the end of October, and it already works very well. Asking where your Ford is will give you a location, the distance and the time it'll take for it to get home. However, it also gives a frustratingly huge amount of information, like the date and specific time of the request, which seems pointless. (Also, the latter function will mean secretive partners will have a reason to worry when the other half can track them at any time when they're supposed to be somewhere else). Trying the system the other way around (from the car to the home) was a less impressive demonstration - although this is early days for the project, with cars being able to use it fully not coming for a few months yet. You'll need to hold down a button to begin speech, say 'Alexa' to start the system up, and then speak with a very specific phrase (for instance 'Ask the garage to open' rather than 'Open my garage'). It's not as simple as just saying 'Alexa' when in the car and being able to instantly ask the car to do something, and the demo was rather laggy at times - but then again, it's astounding how quickly the brand has created this system and there's a lot of time left to evolve it to make it a cleaner and more easy to use way of talking to your house. The whole thing is handled in the cloud by Amazon, so it requires a working internet connection at all times to function correctly. This means that only cars with integrated modems - coming next year but quickly rolling to more vehicles in the following months - will be able to pass commands both ways, although phones can obviously handle the Alexa services when in vehicle. Something like this Alexa / Ford tie in seems like an obvious way to make cars that are much smarter. I've tried vehicle voice recognition systems in the past, and they've been a little clunky to use. Here's hoping that 'clunk' begins to be resolved in the coming months, and the Ford system in the car works as well as the Amazon Echo device in your home. There were some definite bugs in this system during the trial, but the speed with which it's been created mean that things like more natural language recognition and faster start up times will could well be in place at launch. If Ford's goal of having your car be the ultimate trigger for your home life (imagine heading to your internet-connected cabin for the weekend and it being ready-warmed when it noted you were two hours away) is to come to pass, then it needs a little more finessing - but the idea of the car being an integral part of your smart home is more than a little awesome.